The number of Nigerians living in poverty is increasing significantly, revealing a perplexing contrast between the nation’s economic statistics on rapid economic growth and minimal welfare improvements for much of the population, the World Bank has said. 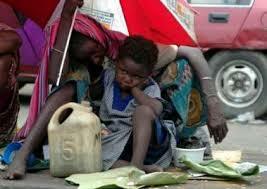 “Poverty rates remain high in Nigeria, particularly in rural areas. These rates declined between 2003-2004 and 2009- 2010, although not nearly as fast as would be expected from the pace of economic growth in the country,” the World Bank said in its ‘Nigeria Economic Report’ May, 2013. “While the officially reported growth rates of GDP well exceed population growth in the country, the pace of poverty reduction does not, this implies that the number of poor Nigerians living below the poverty line has grown measurably,” the report stated. The World Bank said the first Nigeria Economic Report is designed to give some attention to longer term trends in the country, including the puzzle of why a decade of rapid GDP growth by official statistics, concentrated in the pro-poor areas of agriculture and trade, did not bring stronger welfare and employment benefits to the population. Aside from the increase in poverty, the organisation said progress towards a number of the other Millennium Development Goals in Nigeria has also been disappointing, stating that Nigeria was ranked 153 out of 186 countries in the 2013 United Nations Human Development Index, as unemployment rates have been steadily increasing and younger Nigerians are encountering increasing difficulty in finding gainful employment. The organisation said available data on unemployment suggest a similar story. “Job creation in Nigeria has been inadequate to keep pace with the expanding working age population. The official unemployment rate has steadily increased from 12% of the working age population in 2006 to 24% in 2011. Preliminary indications are that this upward trend continued in 2012. Another issue the report highlighted was that the official definition of employment in Nigeria (less than 40 hours worked in the past week) is unusual, and is therefore not comparable to that in most other countries. The negative dynamic is very consistent, however, with perceptions of the population of increasing difficulties for finding gainful employment. Going by this, the problem in Nigeria might best be interpreted as underemployment in contrast to unemployment proper. Reports over the recent years have continued to highlight the concern that the Nigerian economic statistics reveals a puzzling contrast between rapid economic growth and quite minimal welfare improvements for much of the population. Nigeria’s annual growth rates that average over 7 per cent in official data during the last decade place the nation among the fastest growing economies in the world. This growth has been concentrated particularly in trade and agriculture, which would suggest substantial welfare benefits for many Nigerians. “Nevertheless, improvements in social welfare indicators have been much slower than would be expected in the context of this growth. Poverty reduction and job creation have not kept pace with population growth, implying social distress for an increasing number of Nigerians. Progress toward the fulfillment of many of the Millennium Development Goals has been slow, and the country ranked 153 out of 186 countries in the 2013 United Nations Human Development Index” the World Bank said. The Organisation said further data collection and investigations will be necessary to clarify this picture of what factors are responsible or explain the disparities between economic growth and the welfare indicators of the nation. “Given the seeming inconsistencies between the national accounts data summarized above and statistics based on other surveys, it is imperative to conduct further investigations and statistical tests to uncover the true growth and development story in Nigeria” the World Bank said. Against this backdrop, the World Bank said it is imperative that Nigeria finds a recipe to unlock rapid growth and job creation in a larger part of the country, as well as to increase standards of education, health, and other social services to enable its citizens to find gainful employment in the emerging growth poles. Despite the challenges, the World Bank states that the macroeconomic outlook for Nigeria in 2013 appears fairly strong, assuming that oil prices do not decline sharply and oil output stabilizes. The foreign inflows that generated the balance of payments surplus and reserve accumulation should continue, and will stimulate domestic demand. In this context, particularly if there are better weather conditions in 2013, the pace of economic growth could accelerate somewhat. “Overall, 2013 should provide a favourable context for the realization of key reforms and investments (power, roads, business climate, education, health, agriculture) that could generate the non-oil growth, productivity increases, and jobs needed to ensure the country’s prosperous future”. The Jonathan administration has increasingly made reference to Nigeria’s GDP and economic growth as signs of successes while the opposition and several Nigerians lament that those growth have not had a corresponding effect on the lives of average Nigerians. This entry was posted in News and tagged economic growth, Nigerian, Poverty, productivity increases, Unemployment, World Bank. Bookmark the permalink.